Welcome to our Sioux Falls Collision Center! We can perform the services to restore your GM vehicle's safety, comfort, and performance! Learn what to expect from our collision center experts, the reasons for using genuine GM parts! 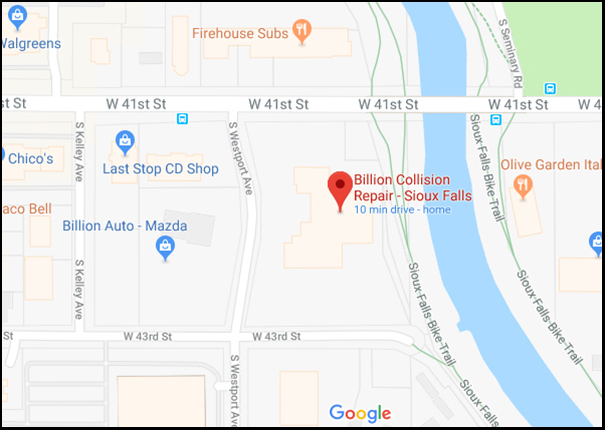 At Billion Auto's Sioux Falls Body Shop, we care about our customers and their automobiles. That's why we strive to provide excellent service for everyone that walks through our doors. We are a leading auto repair shop in the Sioux Falls area with great experience in fixing cars the right way, right from the start. Beyond just our experience and service, we are backed by our great relationships with highly-trusted members of the automotive community. Drop by our location in Sioux Falls any time! Why Fix Your Car or Truck With Billion Auto? Our Certified Service technicians in Sioux Falls are trained by GM to know every inch of your GM vehicle. We understand your vehicle and all its technical systems. We’re proud to offer genuine GM parts. We know you want to feel as good about your vehicle today as you did the day you bought it. Our technicians have the skills and finesse you need to restore your vehicle so it will look and feel like new. We’ll create a written estimate of what’s recommended to complete the repair, and we will offer Genuine GM Parts. In addition, if there is other service work that is required to restore your vehicle to pre-accident condition, we have Certified Service technicians on hand right here in Sioux Falls, South Dakota. We will review this estimate with you and address any questions you may have. We will take care of your vehicle with the level of customer service you deserve!